David Nash, GM Nutrition & Quality Equine Nutritionist BARASTOC (Ridley) As winter is fast approaching we need to look at preparing to feed and maintain our old trusted friend over winter. This is extremely important as winter in the colder parts of Australia can be quite difficult for older horses if we are not prepared. First of all we need to categorise what constitutes and old or geriatric horse and at what stage of condition and activity is it at. Generally a horse over 15 years that is in light to no work would be considered geriatric. With the advent of better veterinary care and anthelmintic (wormers) horses are consistently living and performing at high standards well into their twenties. Obviously there are exceptions to the rule but we will look at the average animal. Like humans as horses get older their ability to digest feed diminishes, as their teeth erode and elongate their ability to chew and assist with digestion is also reduced. Key selection of feeds for geriatric horses need to be considered to enable your geriatric horse to still flourish. Preparation for Winter As winter approaches I would like to see your older horse in a condition score that is well covered and moderate to fleshy. The reason for this is that keeping warm during winter can increase the horses’ energy requirement by 25%. If we are not matching its energy requirements the horse will call on its body reserves and loose condition as a result. If you horse is not rugged over winter I would suggest investing in a quality rug that will keep your horse warm and dry. If you can help shield your horse from the wind and rain it will save your horse from using valuable energy trying to keep warm. Ensure your horse has shelter and or a wind break. Shelters accompanied with rugging will greatly assist in maintaining condition. It would also be wise to have your horses teeth checked by a qualified dentist and ensure you have the correct worming program in place. If you are unsure consult your veterinarian. The diet When designing your diet for your older horse you need to take into consideration several aspects such as current weight, desired weight, metabolism, and climate and activity level. For example a horse in warm environment will not be under the same stress as a horse in the high country of Victoria during winter. An easy way to assess your horses, requirements is to consult your nutritionist. Many companies have ration evaluators which can help you discover what your horses requirements are. Accompanied with a history of what you have feed in the past and condition score, condition targets and proposed workloads, a qualified nutritionist will be able to give you a suggested diet and or your horses requirements so you can develop your own feeding program. 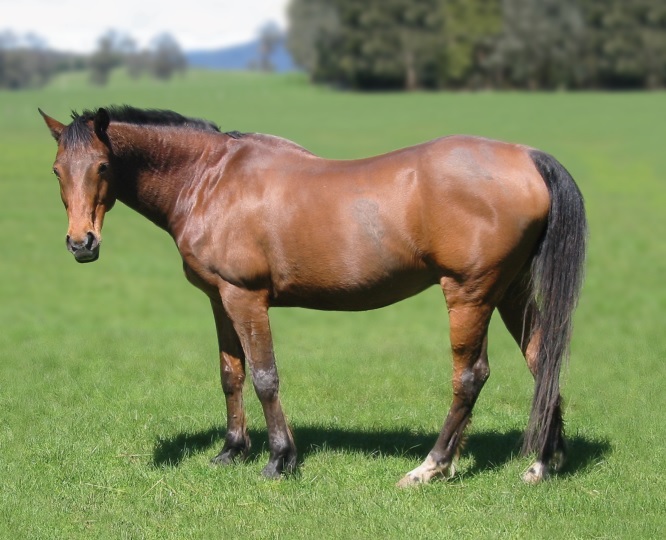 Fibre – the key Every nutritionist will say you start planning the horses diet with roughage / fibre. As a horse gets older its ability to firstly chew roughage and then digest can be diminished. Selecting high quality (softer to the touch) roughage sources such as hay and chaff will enable the horse to derive more nutrients from the roughage source. A simple grab test will determine the digestibility of the roughage. The softer it is generally the more digestible, the harder / stalkier it is the less digestible. One advantage of a high fibre diet is that when horses ferment the fibre in their large intestine a by-product of this digestion is heat. Internal heat being produced by the horse will help keep them warm during cold / windy periods. I would suggest basing a horses diet on approximately 1.5% of their bodyweight in roughage. This could be a combination of pasture, hay and or chaff / super fibres etc. Do I need to supplement feed during winter? The extent to which we will supplement feed will depend on what is naturally available to our horse, its condition and work load. If there is adequate pasture and the horse is maintaining condition I would suggest a supplement such as a block or balancer pellet /powder to ensure that they are receiving their trace minerals and vitamins. This will assist in bone and joint integrity as well as generally health and body function. Remember they are not as resilient and adaptive as they once were. If they require additional supplementation of prepared feed I would suggest feed that has been cooked to assist in digestion as well as feeds that contain ‘super fibres’. These fibres are very well digestible by the animal but do not have high level of starches which can negatively affect the horse. There are many prepared horse feeds that are designed for the older horse. Nearly all of them will have cooked grains for increased digestion, elevated levels of vitamins and minerals, super fibres. Some will have elevated levels of omega 3’s and or nutraceuticals such as glucosamine, designed to assist with joint inflammation. All of these feeds are designed with the older horse in mind. You need to ensure if you use these feeds that you take care to read the label to ensure you are feeding the feed at the correct rate. If you are feeding a feed which requires to be fed at 4kg/ day and you are only feeding 1 kg/day obviously you will not be meeting your horses’ nutrient requirements. If 1kg/day is maintaining your horses’ condition I would suggest using a feed that is designed to be fed at this rate. If your older horse is suffering from metabolic problems such as EMS, has Cushing ’s syndrome or is prone to laminitis please consult your veterinarian and nutritional advice specifically for your horse. The key message for caring for you older horse is to monitor them every week or so. Take their rug off and check their condition. If they have changed, make the adjustment to their diet or their environment. It is a lot easier to maintain condition than have to work to build back condition of your horse. Please remember when coming out of winter and spring is underway the pasture will be in a rapid growth phase. You will need to keep a watchful eye on all of your horses to ensure they maintain their condition and do not gain weight too fast. Be the first to hear about new products, news, competitions and more. You’ll now be in the know for new products, news and events.